This is plate 29 of Robert Melville Grindlay's 'Scenery, Costumes and Architecture chiefly on the Western Side of India'. Grindlay (1786-1877) was only seventeen when he arrived in India. He served with the Bombay Native Infantry between 1804 and 1820, and during this period he made a large collection of sketches and drawings. 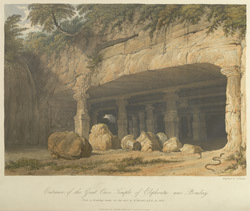 Grindlay visited the island of Elephanta as soon as he arrived in Bombay in 1803. The island is near Bombay and derives its popular name from the figure of a gigantic carved elephant near the landing place. The temple, dedicated to Shiva, was completely excavated from the rock in the 6th century. High above the water line, it can be reached by a long flight of steps. The main entrance is through this columned hall.